Eric Trupheme of Ocean Independence calls to say that the price of his central agency for sale, Ocea's 32.7 commuter yacht Paolyre, has had a significant price cut. 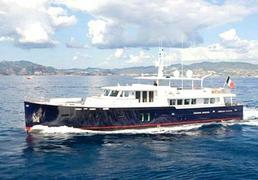 Built in aluminium in 2008, she certainly stands out from the crowd and accommodates 10 guests in five cabins. Her aft deck features a seating area with a large table for eight guests, while the upper deck is covered by a fixed sunroof and has six sofas and four dining tables, plus a grill, bar and Jacuzzi. French commercial classed and MCA compliant, Paolyre is now asking €6.9 million.